Waist Beads By Waisted Gems Specializing in Luxury Handcrafted Adornments. Enjoy your visit!! 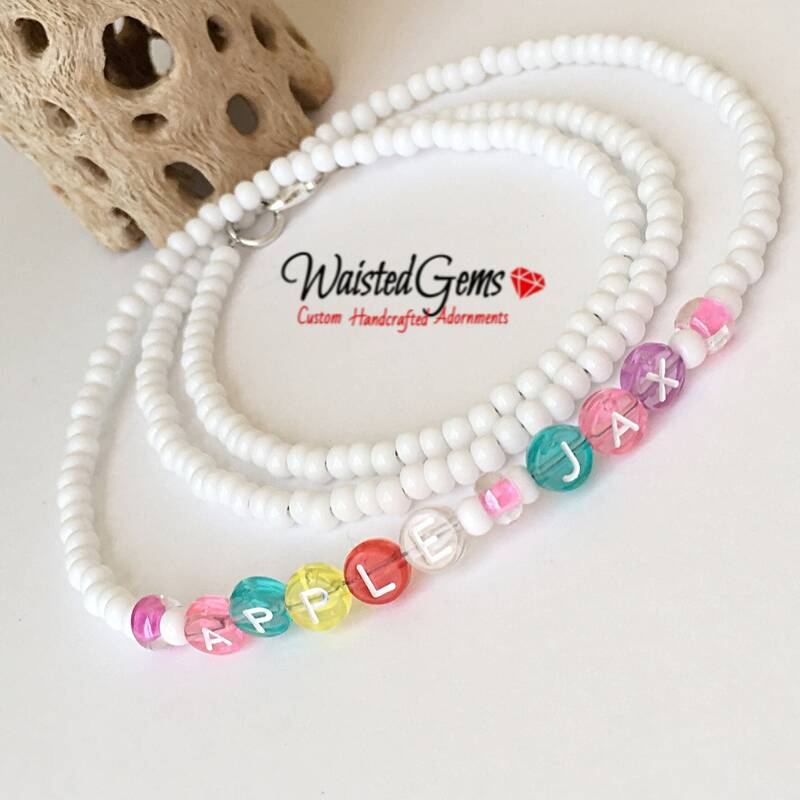 Custom Name Waist Beads are crafted with white Czech seed beads and pastel letters on a durable beading wire and silver tone clasp. Waist beads are ancient traditional body jewelry and practice of adornment. Worn regularly they become an extension of yourself, a secret, seen only by you and the lover(s) you choose. Waist beads are worn by females of all ages from children to grandmothers and by all size women. They are given as gifts for initiations, rites of passage, to women about to marry, to pregnant women for protection and health, and to young girls to welcome them as members of the female group. ; and are typically worn against the skin, underneath clothing, and below the belly button. This ancient adornment practice is a great way to celebrate your femininity, milestones, and enhance personal transformation, and affirm creativity and sexuality. Feel free to request a custom order if you don't find what you're looking for, I'd be more than happy to create a piece based on your ideas solely for you. I make my pieces to fit all sizes regardless of how big or small. You are not limited to the amount that you can wear, its all up to you so, Get Waisted Today!!! Waisted Gems/Zsavette has superior customer service skills! She was tracking the order and noticed right away when there was a problem. I can't say enough about how wonderful she is. And of course the waist beads are beautiful. I will definitely be ordering more.